Anderson’s Bridge is the modification of Maxwell’s inductance-capacitance bridge. In Anderson’s bridge, a standard capacitor is used for the measurement of self-inductance. The main advantage of this method is that it can be used for the wide range of self-inductance measurement. The following figure shows Anderson’s bridge for the balance conditions. C = fixed standard capacitor. 1) In Anderson’s bridge, it is very easy to obtain the balance point as compared to Maxwell’s bridge. 2) In this bridge, a fixed standard capacitor is used therefore there is no need of costly variable capacitor. 3) This method is very accurate for measurement of capacitance in terms of inductance. 1) It is more complex as compared with Maxwell’s inductance bridge. It has more parts and hence complex in setting up and manipulate. The balance equations of Anderson’s bridge are quite complex and much more tedious. 2) An additional junction point increases the difficulty of shielding the bridge. Schering Bridge (Measurement of Capacitance). Hay’s bridge for measurement of inductance. 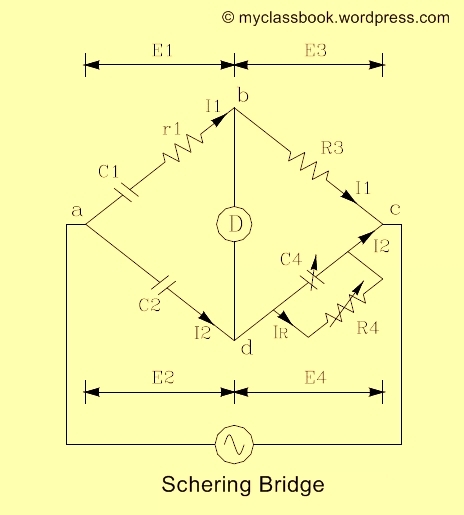 Hi friends, this post provides an information about Schering bridge which is used for measurement of capacitance. We will also see its phasor diagram, advantages and disadvantages. The connections and phasor diagram of the Schering bridge under balance conditions are shown in figure below. 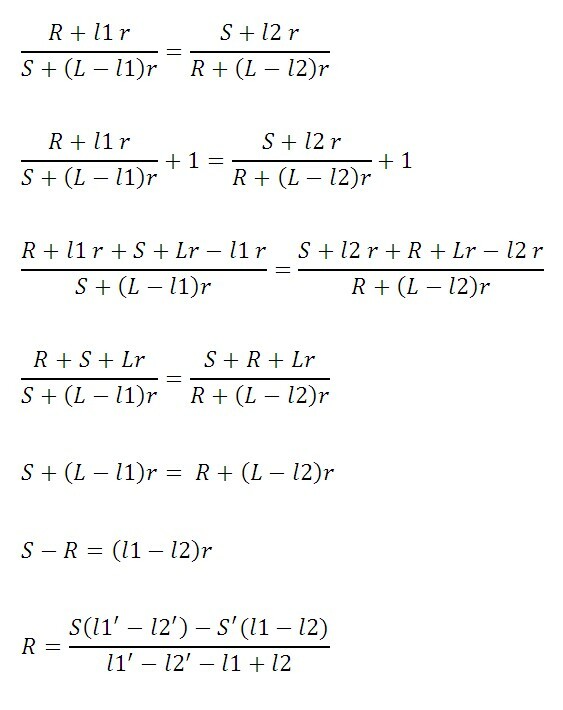 Two independent balance equations are obtained if C4 and R4 are chosen as the variable elements. Therefore values of capacitance C1 and its dissipation factor are obtained from the values of bridge elements at balance. In the above equation value of R4 and C2 are fixed therefore the dial resistor R3 may be calibrated to read the capacitance directly. 1) The balance equation is independent of frequency. 2) It is used for measuring the insulating properties of electrical cables and equipments. I hope you liked this article. Please share this with your friends and like our facebook page for upcoming posts. Have a nice day! Hi friends, in this article we will learn Cathode Ray Oscilloscope (CRO). We will see the introduction, a block diagram of CRO and CRO Working. Every electronic circuit has multiple electronic components connected to each other. At some point in time, we need to test the working of a circuit with the help of some parameters like current, voltage, power, etc. For such kind of testing, a very commonly used electronic device is Cathode Ray Oscilloscope i.e. CRO. Lets first study the block diagram of CRO first and then we will move to Cathode Ray Oscilloscope CRO working. CRT Produces a sharply focused beam of electrons, accelerated to a very high velocity. This electron beam travels from the electron gun to the screen. The electron gun consists of filament, cathode, control grid, accelerating anodes and focusing anode. While travelling to the screen, electron beams passes between a set of vertical deflecting plates and a set of horizontal deflection plates. Voltages applied to these plates can move the beam in vertical and horizontal plane respectively. The electron beam then strikes the fluorescent material (phosphor) deposited on the screen with sufficient energy to cause the screen to light up in a small spot. The input signal is applied to the vertical amplifier. The gain of this amplifier can be controlled by VOLT/DIV knob. Output of this amplifier is applied to the delay line. The delay Line retards the arrival of the input waveform at the vertical deflection plates until the trigger and time base circuits start the sweep of the beam. The delay line produces a delay of 0.25 microsecond so that the leading edge of the input waveform can be viewed even though it was used to trigger the sweep. A sample of the input waveform is fed to a trigger circuit which produces a trigger pulse at some selected point on the input waveform. This trigger pulse is used to start the time base generator which then starts the horizontal sweep of CRT spot from left hand side of the screen. This produces a saw-tooth waveform that is used as horizontal deflection voltage of CRT. The rate of rise of a positive going part of the sawtooth waveform is controlled by TIME/DIV knob. The sawtooth voltage is fed to the horizontal amplifier if the switch is in the INTERNAL position. If the switch is in EXT. position, an external horizontal input can be applied to the horizontal amplifier. This amplifies the saw-tooth voltage. As it includes a phase inverter two outputs are produced. Positive going sawtooth and negative going sawtooth are applied to right – hand and left – hand horizontal deflection plates of CRT. The blanking circuit is necessary to eliminate the retrace that would occur when the spot on CRT screen moves from right side to left side” This retrace can cause confusion if it is not eliminate. The blanking voltage is produced by sweep generator. Hence a high negative voltage is applied to the control grid during retrace period or a high positive voltage is applied to the cathode in CRT. When a sawtooth voltage is applied to horizontal plates and an input signal is applied to vertical plates, display of vertical input signal is obtained on the screen as a function of time. A high voltage section is used to operate CRT and a low voltage section is used to supply electronic circuit of the oscilloscope. I hope you have enjoyed reading the CRO working. Please share it with your friends and like our facebook page for future updates. If you have doubts please share it through the comment section below. Tags: Working of CRO, How CRO generates waveforms, Working principle of CRO, CRO working. This wattmeter uses two similar thermocouples (1 and 2) whose outputs are connected in opposition with a galvanometer in between. Rh is the resistance of each thermocouple heating element. R is high series resistance, and between C and D is a low resistance R2 capable of carrying the load current i. the resistance R2 develops a potential difference which depends upon the load current, together with the current of one heater, and the series resistance R carries the current of both heaters. 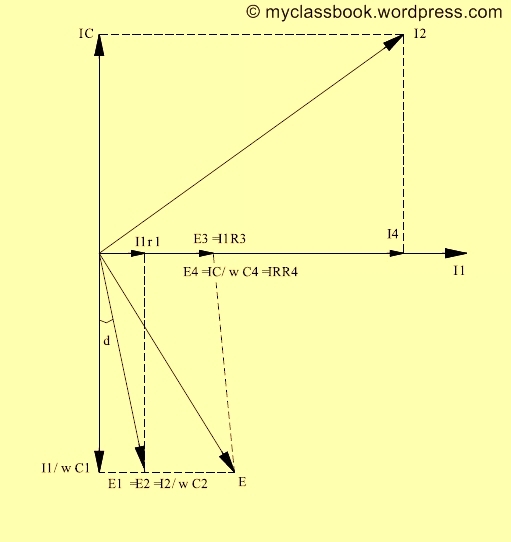 If Rh+R is not very different from Rh, the C2*i^2 may be neglected and T(inst.) is directly proportional to v*i or instantaneous power. Thus, galvanometer may be calibrated to read the power. The commercial thermal wattmeters employ a number of thermocouples connected in the form of a chain in order to increase the output. C.T.s and P.T.s are also used with these instruments. For high frequency measurements careful shielding is required. The thermal wattmeters can be used for measurement of power is several circuits and the sum of their outputs can be applied to a recording potentiometer which records the total power. These wattmeters are used for measurement of small amount of power, practically when the voltage is high and power factor is low. 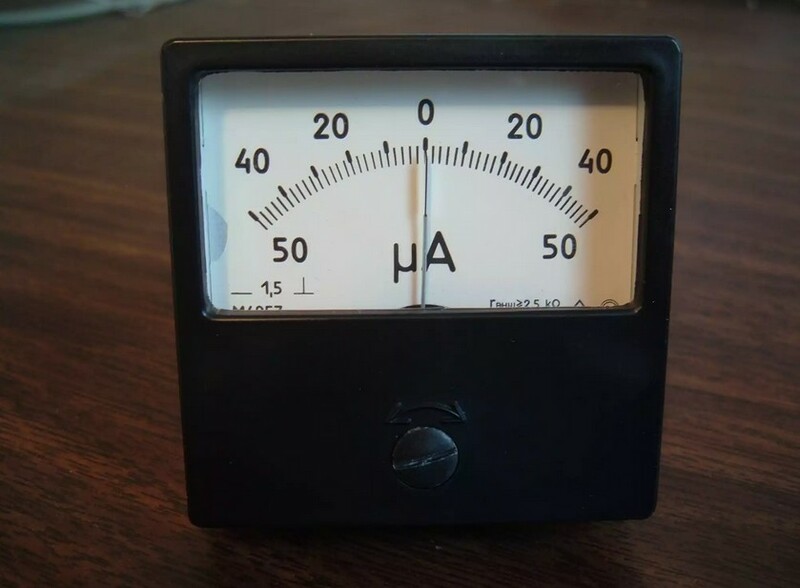 This type of wattmeter is also used for measurement of dielectric loss of cables on alternating voltage and for calibration of wattmeters and energy meters. 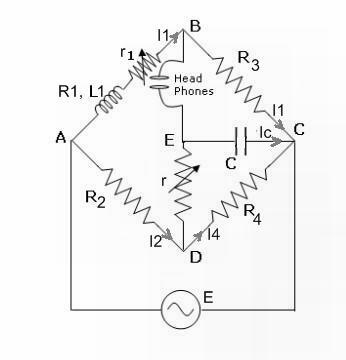 Electrostatic wattmeter consists of a quadrant electrometer used with a non-inductive resistor R as shown in figure below. i.e. instantaneous torque is proportional to the instantaneous power in the load plus half of the power lost in noninductive resistance. Electrostatic wattmeter is a precision instrument and should be used as such. It is free from errors on account of waveforms, frequency and eddy currents. It has a very small working torque.